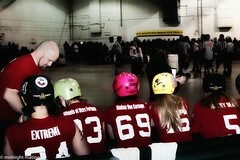 The remarkable team from Nickel City Roller Derby have kindly provided this next installment of life in their league: their adventure to Toronto, and provided an overview into the runnings of NCRD in a land far far away called Sudbury, Ontario. 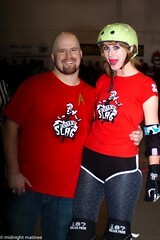 Back in February, NCRD president and “Derby Mama” Madam Von Carnage provided part one of the story Sister Slag Prepares to Rock Toronto. Welcome to part 2. Becky Madam Von Carnage Taylor, [above] President of NCRD and #69 on the Sister Slag. Click on the Flickr badge below to see more shots from Sister Slag and Luscious Lunch Ladies.